This is the video game artbook for the Japanese mobile game Puzzle & Dragons that was released in 2012. It's essentially a character design book featuring the characters that are shown in the game. The book is quite big, almost A4 size, landscape, hardcover, and at 208 pages is quite thick. The illustrations are printed huge and it's quite a joy to look at. You can now see all the details clearly as compared to them on mobile devices. The Japanese style characters are wonderful, with beautifully designed costumes and settings. Some of them have the whole scene drawn together, others have accompanying monsters, animals and spirits, and there are beautiful effects like flames, lightning, water, etc. The art looks dynamic even when the characters are not striking any action poses. Most of the pieces have sketches and alternate versions included. So in all, there are probably close to 90 characters featured. 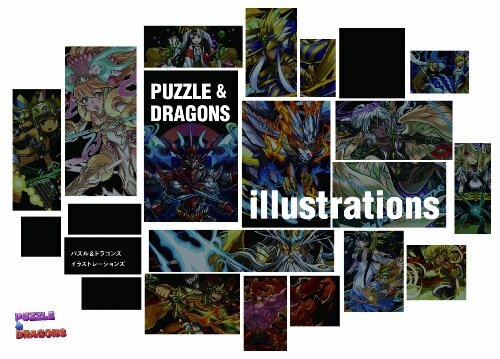 If you like Puzzles and Dragons, there's also another artbook for the sequel called The Art of パズドラZ (The Art of Puzzle and Dragons Z) which is a background design book.